‘STAR WARS 7: THE FORCE AWAKENS’ was a blockbuster in 2015 and now comes “Star Wars 8: The Last Jedi”. 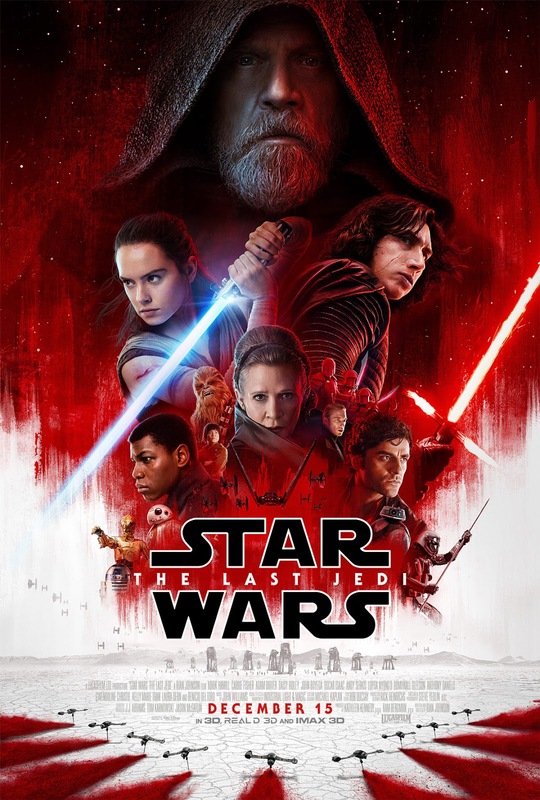 The last film ended with Rey (Daisy Ridley), a female scrapper who has the force within her, succeeds in locating Luke Skywalker (Mark Hamill), now weary and grizzled, who has exiled himself in a lonely planet. She wants him to be Obi Wan Kenobi and teach her how to be a Jedi. She hands him his own light saber but, instead of thanking her, he throws it away. She’s hoping to convince him to rejoin the rebel alliance versus the First Order headed by Supreme Leader Snoke (Andy Serkis, in his usual motion-capture thingie ala-Gollum) and his apprentice, Kylo Ren (the ugly Adam Driver), who could himself be a Jedi since he’s the son of Han Solo and Princess Leia, but chooses to side with the dark forces, making his Uncle Luke, who used to mentor him, so disappointed. Aside from them, also back from SW7 are Princess now Gen. Leia (Carrie Fisher in her last film), pilot Poe Dameron (Oscar Isaac), former stormtrooper Finn (John Boyega), and androids BB8, C3PO and R2D2. In the opening scene, resistance fighters are nearly decimated by the First Order’s tracking device. Leia is hurt and becomes unconscious and Vice Admiral Holdo (Laura Dern) takes over. Poe, Finn and a female mechanic, Rose Tico (Kelly Marie Tran) do not approve of her strategy and try to find the tracking device and disable it on their own. There seems to be a developing love angle between Finn (who’s black) and Rose (an Asian), to show diversity even in outer space (and in the lucrative franchise). Rey and Kylo discover that they have a special connection and can communicate directly with each other even if they’re so far apart. Since Luke won’t join her, Rey leaves him and is captured by the forces of Snoke. Luke, in turn, sees an apparition of Yoda who tells him that failure is the greatest teacher. In front of Rey and Kylo, Snoke reveals that he’s actually the one who controls the special psychic hotline connection between them as part of his plan to kill Luke. But will he be in for a very big surprise. And the audience, too, will be surprised to see who’d replace him as First Order’s Supreme Leader. SW7 was directed by JJ Abrams, who now produces SW8, which is now directed by Rian Johnson, best known for “Looper”, a sci-fi thriller involving time travel starring Bruce Willis. Although SW8 offers some good moments and rousing action scenes in impressively executed space battles, especially that climactic scene showing Rey and Kylo joining forces with their light sabers in demolishing some guards, the overall effect of the film is underwhelming. It runs for a needless two hours and a half and you can see a lot of the padding in so many “daldalan” portions with high “boringa” factor to stretch the running time. If we’re watching this on DVD, we’d be doing a lot of fast forwards. After Snoke makes an exit, the movie still goes on for about half an hour showing the resistance members trying to escape to an old Rebel Alliance base on another planet aboard evacuation ransports that become the target of the First Order under its new leader. Luke reappears and even has a showdown with Kylo to tell him that he (Luke) is not the last Jedi. Honestly, after this, there seems to be no more interesting or compelling story to tell. The war versus the Evil Empire has actually ended in “Return of the Jedi”, which also saw the end of Luke and Anakin’s own journeys. After that, they introduced new characters in this new trilogy but that far away galaxy as we know seems to have shrunk and even the villains are now less scary. But the new CGI-created animals all seem more interesting than the ewoks. And they are all merchandise-friendly for added income for the producers.